Only the second puzzle from this setter who made his debut in the i back in May and seems to have become a regular in the Independent. Unfamiliarity with Kairos’s style led to a fair bit of head scratching, but with four fifteen letter answers around the edges, 3 of which I found quite straightforward, although Round = Game at 8d seems a bit vague to me, there were a goodly number of checking letters to help solving. 1a had me fooled for a long time thinking that “cunning” was an anagrind. Two new words at 17dn and 22dn were both solved from the cryptic. 17dn is a chemical and “Hypnotic” seems a bit of a stretch to me. In general a quite enjoyable puzzle a couple of groans 15a in particular and I preferred Fridays clue for 10a. A bit of discussion over on Fiteensquared regarding the parsing of 25a and 14d both of which seemed fine to me. Phi at the top of his game last week, I thought. Nothing particularly hard – I agree with the general sentiment that Phi has been going gentle on us of late – but lots of fine crafting went in to those clues. It’s no mean feat to create a satisfying 7-word clue for ‘half-lives’, for example, and there were plenty of others where Phi showed how he’s a master of creating smooth clues for tricky looking words. 2013 blog with answers is here. P.S. Have just read said blog to discover a Cloud Atlas theme – see the final comment on the other side. Didn’t spot it, it’s quite subtle, but I do remember thinking about it whilst solving 11a (I first met the word Orison via a chapter called ‘The Orison of Omni 451’). Great book and film. It took me a long time to get into this reprint of a Saturday prize puzzle, there seemed to be a lot of very devious misdirection’s, that’s not a complaint as It was all (with one exception) thoroughly enjoyable. the exception is 20d which seemed to me to be a bit of weak construction to indicate a very obscure piece of American slang. Both 14 and 15d were entered without being able to fully parse and the clever 28a wouldn’t have been solved without all the crossers. Lots of ticks though 13a.17a and 21a I thought worthy and 5a I marked as “evil” but in a good way. Note to self Must remember Gam = School and LLano = Plain these crop up quite frequently and I always seem to have trouble with them. A little on the challenging side, I thought, though I am a little under the weather at the moment so that could be to blame. Especially given how long it took me to spot the hidden clue. There’s a theme, which I totally missed – thinking we were on our way to a pangram – of double letters in each of the clues, which I wish I’d spotted because it would have made life much easier. 10ac I knew thanks to this song: https://www.youtube.com/watch?v=ddbnr-YjmMY, 23ac thanks to the local library when I was young. 15ac I didn’t. COD? 25ac – ‘Stick at shaving facial hair (6)’. A new setter to mark puzzle 2017, Commoner seems to have been a once-a-month Sunday compiler for a couple of years back in 2013-15. You can read the full blog from his first outing at Fifteensquared here. So no Dac on a Wednesday, no JonofWales, and the blog’s going out before 9 – better check the world’s still spinning on its axis and the sun came up. 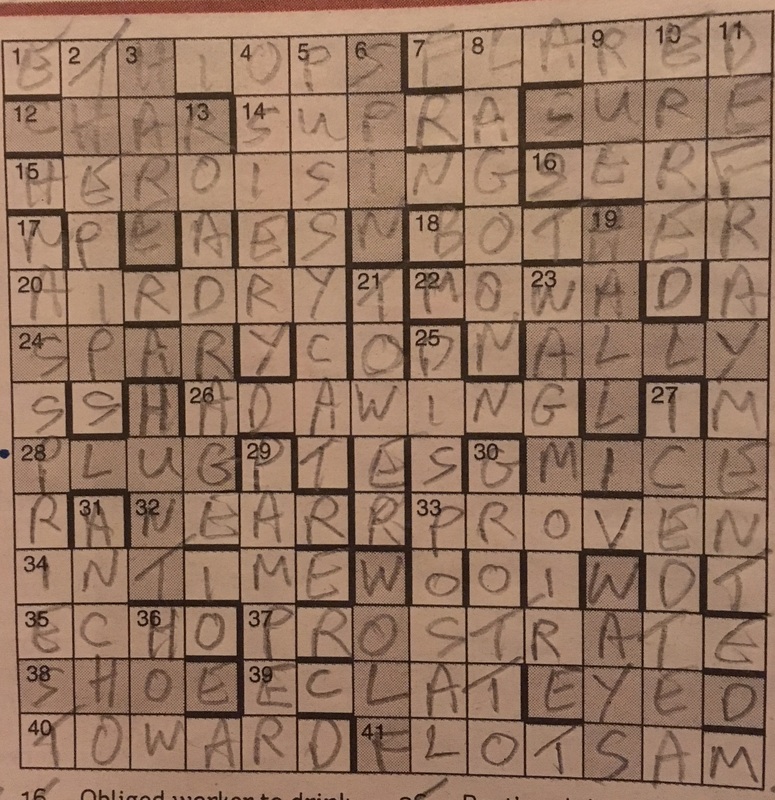 A surprise to see Phi’s name next to the crossword today, but his fondness for themes, Ninas and whatnot makes him a good fit for the Tuesday slot. This puzzle concerns a certain John 22d, but solvers who are not fans will get on perfectly well without noticing it. If that’s you, there were plenty of similarly unenlightened souls over at Fifteensquared back in March 2013, where you’ll find the usual explanations and a note on how this puzzle came about. “Simple singing recalled in surrounds of Russian lake, mostly with this (9)”. I wonder whether there’s something unusual lurking in the wings for next Saturday? A gentle start to the week from the Don, albeit with a few unknowns in the answers as ever. For me, these came at 8ac who I had to Google, 21ac, and 16d where I lobbed in the letters in what looked like a sensible pattern and got away with it. COD? 23ac – “Brighter lady involved with boy in audacious act of exploitation (8,7)’. Phi has confounded me for the second week running by giving us a ‘normal’ puzzle again. One unfamiliar term for me – ‘Fit to be tied’ – but once I had all the crossers, then it had to be, really.